Emily here to report that Crab Team is on the road again, spending three days in Padilla Bay where the second confirmed capture of European green crab in Washington’s Salish Sea took place only a week ago. The capture occurred less than a week after we returned from San Juan Island, relieved not to have found any additional invasive crabs. Thankfully, we hadn’t yet finished re-stowing the gear. 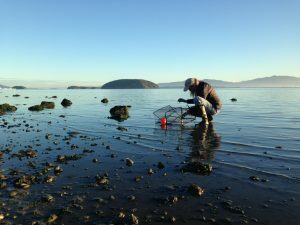 Similar to our trip to San Juan Island, we are conducting extensive trapping in an effort to learn more about whether there are more green crabs in Padilla Bay. One difference, however, is scale. Padilla Bay is massive and it’s hard to know exactly where to start. On San Juan Island, the muddy habitats where we thought crabs would do well are well-defined, and relatively limited. Padilla Bay, on the other hand, is one giant muddy habitat – well not all of it, but certainly a huge portion. We could trap for weeks and still not cover all of the suitable habitat! What’s more, time is not on our side. By October, the low tides we need to set traps temporarily disappear as they shift from being daytime lows characteristic of the summer, to nighttime lows more typical of the winter. Trekking out into the dark to set traps isn’t worth the effort, because crabs lose their appetite in the winter when the water gets cold, and they aren’t as interested in our yummy, disgusting mackerel. So, if we wanted to assess the situation before March, we had to plan quickly! 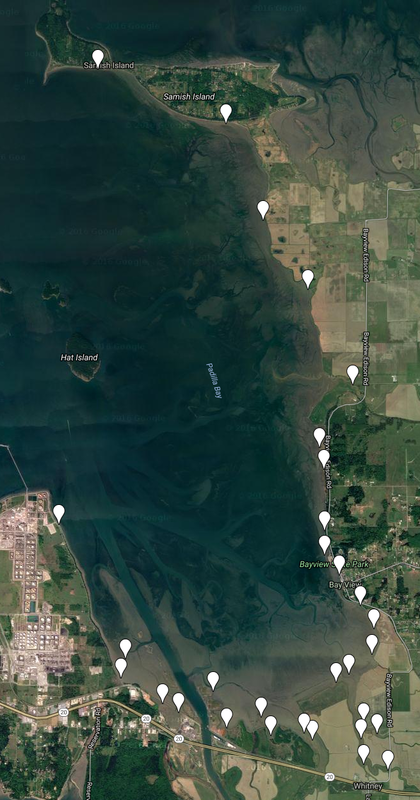 Map of Padilla Bay trapping locations. Click to zoom. Last week was a flurry of conference calls with the Washington Department of Fish and Wildlife (WDFW) and the Padilla Bay NERR. As a group, we tallied up all our gear to see how much ground we could cover with traps. We decided the best approach was to set small arrays of 6 traps (3 minnow, and 3 Fukui) at 31 sites across the bay. 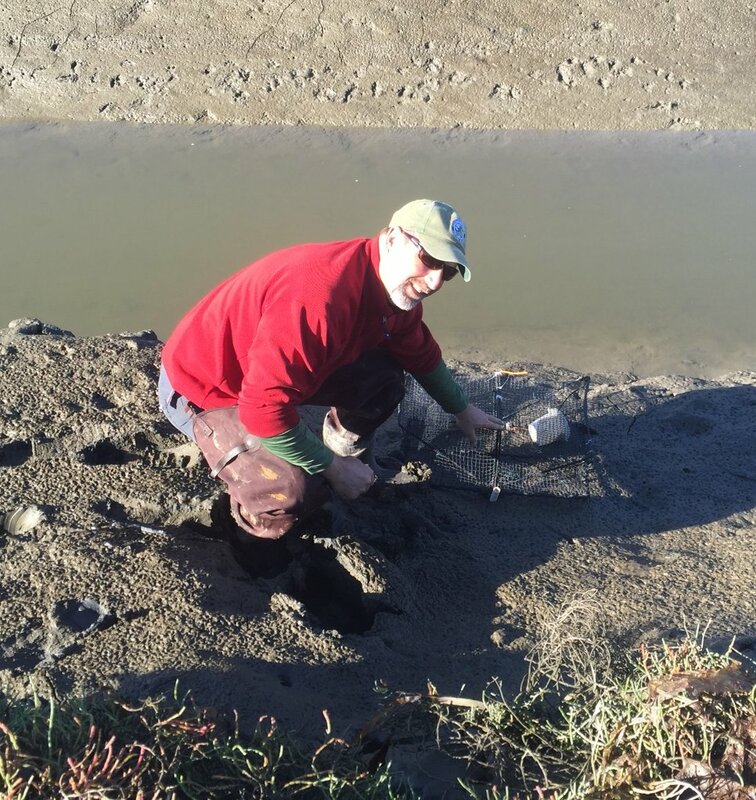 While these trapping sites target soft sediment habitats and undercut banks, we also made sure to set traps so that we covered as much geographic area as possible. We set a couple of sites on gravel and cobble beaches on Samish Island and March’s Point. These are sites we wouldn’t typically think European green crabs would do well, but we want to be sure our expectations don’t cause us to miss a population of crabs in one of these places. If you just did the math, you might be wondering if I’m serious. Yes, we set 192 traps at 31 sites that span about 20 miles of shoreline. Yes, that is nearly double the number we set each day around Westcott Bay. And, yes we planned the effort in less than half the time we had for planning on San Juan Island. 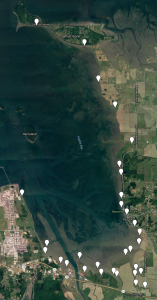 One of the great assets to this response is the fact that the vast majority of shoreline and tideflat in Padilla Bay is public, and devoted to research. The staff of the NERR devote all of their work to the study of this bay, so they know it better than anybody. They have also worked hard to build relationships with private land owners, and the diking districts who have been extremely supportive of our efforts, granting us access to parts of the shoreline that aren’t public. Obtaining permission to sample at this many sites on such short notice is an incredible tour de force, and it wouldn’t have been possible with their expertise. We also have to thank the Swinomish Tribe, Shell Oil, the Swinomish Gun Club, several private owners, and the diking districts. Getting access was a great first step, but we had to put our money where our mouth is … or perhaps, more accurately, our traps where our access is. How on earth do we cover all that ground in one tide? This morning, at 6am, 10 staff from WSG Crab Team, WDFW, and Padilla Bay NERR convened at the reserve’s research facility to divide and conquer. We split our workforce into three teams, each of which tackled a separate region of the bay. Everyone headed out armed with traps, site maps, and, of course, the “nuclear option” in green crab monitoring: buckets of chopped mackerel. No one could argue that today wasn’t a perfect day for a slog in the mud. Perfectly quiet and clear, it was sometimes easy to believe that we were just out for a walk on the beach. Loading up a pack full of traps, and heading off down the trail to spot snipes and red tailed hawks. 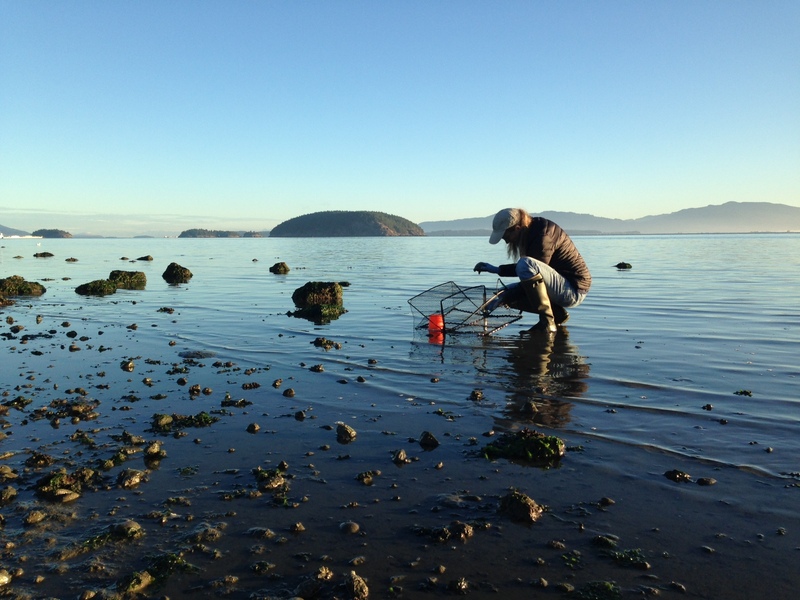 Sharon Riggs from Padilla Bay NERR sets a Fukui trap at the crack of dawn this morning. Sharon has been monitoring the reserve annually for European green crabs since 2002. Helping with this rapid response is fitting as Sharon celebrates her retirement later this week! Congratulations, Sharon! Six hours later, all 192 traps were set, ready and waiting for the return of the tide so they could get to work. And we were all back at the lab, rinsing the mud off, and ready to get to our work as well, which for now, is waiting. Tomorrow teams head back to their sites to check traps and refresh bait. We will keep the traps in place for another 24 hours and wrap up on Wednesday. While this effort is far from finished, we are glad to take a few moments to celebrate a successful start to the collaboration. The Padilla Bay NERR lab is perfectly set up to host this type of activity, and we are excited to try out WDFW’s mobile invasive species response unit to help decontaminate our gear before we leave. There’s more! Read about Day 2 and our wrap up and summary. If you’re eager to watch us in action, check out a recent story from EarthFix, who joined Sean and me in Westcott Bay for our final day of sampling on San Juan Island. You’ll feel just like you were there with us, missing only, perhaps, the smell of mud and mackerel!